Sustainable and circular building (materials, energy, water). Granular mix design and concrete/mortar rheology (Self-Compacting Concrete, soil grouts, earth moist concrete, fiber reinforced concrete, oil well cement etc.). Microstructure development and pore water chemistry of hydrating cement/lime/gypsum and cementitious by-products (slag, fly ash etc. ), and their dehydration (e.g. fire response). Treatment of contaminated soils, dredged sediments, industrial waste etc, with the help of air/steam (cleaning) and by mixing with cement/lime/gypsum (immobilization/stabilization). Transport properties and durability of cement/lime/gypsum based materials (Cl- and CO2 diffusion/binding, freeze/thaw etc.). Functional materials: self-cleaning, air-purifying, translucent, thermally buffering, etc. Supervision and coaching: Dr. S. Li (former post-doc), Dr. R.J. van Eijk (former PhD candidate), Prof. Dr. W. Chen M.Sc. (former PhD candidate), Dr. Dipl.-Ing. M. Hunger (former PhD candidate), Dr. Dipl.-Ing. G. Hüsken (former PhD candidate and former post-doc), Dr. Ir. A.C.J. de Korte (former PhD candidate), Dr. Q. Yu M.Sc. (former PhD candidate and former post-doc, currently assistant professor), Dr. M.M. Ballari (former post-doc), Dr. P. Spiesz M.Sc. (former PhD candidate and former post-doc), Dr. M.V.A. Florea-Marinescu M.Sc. (former PhD candidate and former post-doc, currently assistant professor), Dr. A. Lázaro M.Sc. (former PhD candidate, currently post-doc), Dr. G. Quercia M.Sc. (former PhD candidate), Ir. A. Taher (PhD candidate), Dipl.-Eng. S. Lorencik (PhD candidate), Dr. R. Yu M.Sc. (former PhD candidate and post-doc), Dr. P. Tang M.Sc. (former PhD candidate and former post-doc), Dr. Ir. G.C.H. Doudart de la Grée (former PhD candidate), Dipl.-Min. C. Straub (PhD candidate), Ir. P.M.F. van de Wouw (PhD candidate), Dr. X. Gao M.Sc. (former PhD candidate), Dr. B. Yuan M.Sc. (former PhD candidate), Dr. K. Schollbach (post-doc), Dipl.-Eng. K. Kochová (PhD candidate), Q. Alam M.Sc. (PhD candidate), P.P. Li M.Sc. (PhD candidate), Z. Qu B.Sc. (PhD candidate), V. Caprai M.Sc. (PhD candidate), E. Loginova M.Sc. (PhD candidate), H. Karimi (PhD candidate), Dr. G. Gauvin (post-doc), A. Kaja M.Sc. (PhD candidate), G. Liu M.Sc. (PhD candidate), W. Franco Santos M.Sc. (PhD candidate), X.X. Zhang M.Sc. (PhD candidate), Y.X. Chen M.Sc. (PhD candidate) and about 150 graduate projects (completed and ongoing). The PhD research of Dr. Dipl.-Ing. W. Schmidt, Dr. P. Sturm M.Sc. and Mrs. V. Babski M.Sc., coworkers from the BAM Bundesanstalt für Materialforschung und -prüfung (BAM Federal Institute for Materials Research and Testing) in Berlin (Germany), is supervised. Dr. Dipl.-Ing. W. Schmidt investigated the effect of temperature on SCCs containing both superplasticizers and stabilizing agents, Dr. P. Sturm M.Sc. investigated the hydration, structure and durability of one-part geopolymers, and Mrs. V. Babski M.Sc. is investigating the explosion resistance of ultra-high performance concrete. Also the external PhD research by Dr. A. Keulen, coworker of Van Gansewinkel Minerals/Mineralz, is supervised. His PhD topic is the development of geopolymer-based materials using industrial by-products. The projects of Dr. R. Yu M.Sc., P.P. Li M.Sc. and Y.Y.Y. Cao (Development of impact resistant concrete), Dr. P. Tang M.Sc. (Application of MSWI ashes in concrete), Dr. B. Yuan M.Sc. (Development sodium carbonate activated binders), Dr. X. Gao M.Sc. (Combined fly ash and slag based geopolymers), G. Liu M.Sc. (Application of waste glass), X.X. Zhang (Mineral binder-biomaterial composites) and Y.X. Chen (Aerogel development) are hosted within the framework of the China Scholarship Council (CSC). In October 2018, Dr. Sieger van der Laan was appointed part-time chair Building Materials Microstructure in the group, which is sponsored by Tata Steel. Photo: (former) members Sustainable Building research group. Standing (from left to right): Ariën de Korte, Götz Hüsken, Martin Hunger, Ronald van Eijk and Wei Chen. Sitting (from left to right): Bram Entrop, Qingliang Yu, Jos Brouwers, Milagros Ballari, Miruna Florea-Marinescu and Przemek Spiesz (Enschede, 2008). The project: Hydration of blended cements was supported by the Dr. Ir. Cornelis Lely Foundation (Dr. W. Chen) and the sponsor group from 2003-2007. In 2005-2009 involved in the 4-year Integrated Project (EU 6th FP): Re-engineering of natural stone production chain through knowledge-based processes, eco-innovation and new organizational paradigms (Acronym: I-STONE). The group focused on the cement-based R&D within this project: Development of High-Tech Concrete containing Natural Stone (Dr. Dipl.-Ing. M. Hunger). A related project Innovative concrete production focuses on earth-moist concrete (Dr. Dipl.-Ing. G. Hüsken). Concretes with efficient binder use and with additional functionalities (self-cleaning ability, NO degradation ability, enhanced heat buffering etc) were developed and modeled. From the fall of 2005 involved in the EOS Project Exergy analysis of built environment (Acronym: Lowex), sponsored by SenterNovem (EOS program). This Lowex program is jointly executed by the Technical Universities of Eindhoven, Delft and Twente. The UTwente project focuses on the financial yield of exergetic measures and the use of passive solar energy (Dr. ir. A.G. Entrop). In 2007-2011 involved in the 4-year Integrated Project (EU 6th FP): "The intelligent safe & secure built concept" (Acronym: I-SSB). Two PhDs are working on the microstructure modeling and on the technical development of gypsum/cement plasterboards with increased fire safety, nano-particles, impact-resistance, sensors, DeNOx and air-purifying ability etc. (Dr. ir. A.C.J. de Korte and Dr. Q.L. Yu M.Sc.). From April 2008 till December 2010 post-doc (Dr. M.M. Ballari) was working on the full-scale demonstration of 900 m2 air-purifying (DeNOx) stones in a street in Hengelo. This project is sponsored by the province of Overijssel, and executed jointly with Struyk Verwo (CRH group) and the city of Hengelo. From August 2008 till November 2013 a PhD project on durable/sustainable concrete structures has been executed (Dr. P. Spiesz M.Sc.). In September 2008 a PhD study has started on transport phenomena in concrete and immobilisates (Dr. Dipl.-Eng. M.V.A. Florea-Marinescu). These projects are among others sponsored by the Dr. Ir. Cornelis Lely Foundation and the sponsor group. Photo: (former) members Sustainable Building research group. Standing (from left to right): Milagros Ballari, George Quercia, Miruna Florea, Przemek Spiesz, Pei Tang, Azee Taher, Qingliang Yu, Alberto Lazaro, Stepan Lorencik, Rui Yu. Sitting (from left to right): Götz Hüsken, Martin Hunger and Jos Brouwers (Eindhoven, 2011) . As of May 2009 involved in the 4-year Integrated Project (EU 7th FP): "Nano-particle products from new mineral resources in Europe" (Acronym: ProMine), in which nano-silica is synthesized from olivine and acidic mine water (Dr. A. Lazaro M.Sc.). In February 2010 an associated PhD project on the application of nano-silica in building materials has started, sponsored by Selor E.E.I.G. and M2i (Dr. G. Quercia M.Sc.). In October 2010 the STW (Dutch Technology Foundation) 4-year project "Chloride penetration in cracked and uncracked concrete structures" has started , a joint project with T.U. Delft. In total three PhDs (Ir. A. Taher and Z. Qu B.Sc., T.U. Delft: Dr. Dipl.-Eng. A. Blagojevic) are working on humidity and chloride transport in cracked and uncracked concrete, and combined material and structural effects are addressed. Foreign partners in this project, which is part of IS2C, are Sintef (Norway) and BAM (Germany). As of July 2011 a 4-year PhD project on air purifying indoor wall coverings has started, sponsored by BN International and M2i (S. Lorencik M.Sc.). In October 2012 the STW (Dutch Technology Foundation) 4-year project "Development of sustainable and functionalized inorganic binder-biofiber composites" has started. In total 2 PhDs (Ir. G.C.H. Doudart de la Grée, Dipl.-Eng. K. Kochová) and one post-doc (Dr. F. Gauvin) work on the development of sustainable and functional Cement-Wood Composites. As of January 2013 a 4-year PhD project on development of Autoclaved Aerated Concrete has started, sponsored by Hess AAC Systems and M2i (Dipl.-Min. C. Straub). In January 2013 the HTSM-STW (High-Tech Systems and Materials-Dutch Technology Foundation) 4-year project "Tailoring new nano-silica, and its application in smart concrete" has been granted. In total 2 PhDs (Drs. Y. Hendrix, A. Kaja M.Sc.) and one post-doc (Dr. A Lázaro) work on the development of functional and ecological concrete. In December 2013 the HTSM-STW (High-Tech Systems and Materials-Dutch Technology Foundation) 4-year project "Development of eco-concrete using industrial by-products" has been granted. In total 2 PhDs (Ir. P.M.F. van de Wouw, E. Loginova M.Sc.) and one assistant professor (Dr. Dipl.-Eng. M.V.A. Florea) work on the development of ecological concrete by incorporation of industrial by-products. In December 2014 the HTSM-STW (High-Tech Systems and Materials-Dutch Technology Foundation) 4-year project "Environmental concretes based on treated MSWI bottom ashes" has been granted. In total 2 PhDs (Q. Alam M.Sc. and V. Caprai M.Sc.) and one post-doc (Dr. K. Schollbach) work on the development of ecological concrete by incorporation of treated Municipal Solid Waste Incineration bottom ashes. In October 2015 the E.U.-Stimulus project "Application of Miscanthus Giganteus in concrete" has been granted. One PhD (Y. Chen M.Sc.) works on new biomass-concrete composites. In December 2016 the HTM-STW-M2i (High-Tech Materials-Dutch Technology Foundation-Materials Innovation Institute) 4-year project "High-end application of converter steel slag in sustainable building materials" has been granted. In total 3 PhDs (W. Franco Santos M.Sc., M.J. Ahmed M.Sc.) and one post-doc will work on the development of ecological building materials by incorporation of treated converter slags. In May 2017 the PhD project "Development of low shrinkage concretes for monolithic floors" (sponsored by Van Berlo Group) has started (H. Karimi M.Sc.). Photo: (former) members Sustainable Building research group in Wuhan. Sitting (from left to right): Veronica Caprai, Katerina Kochova and Katrin Schollbach. 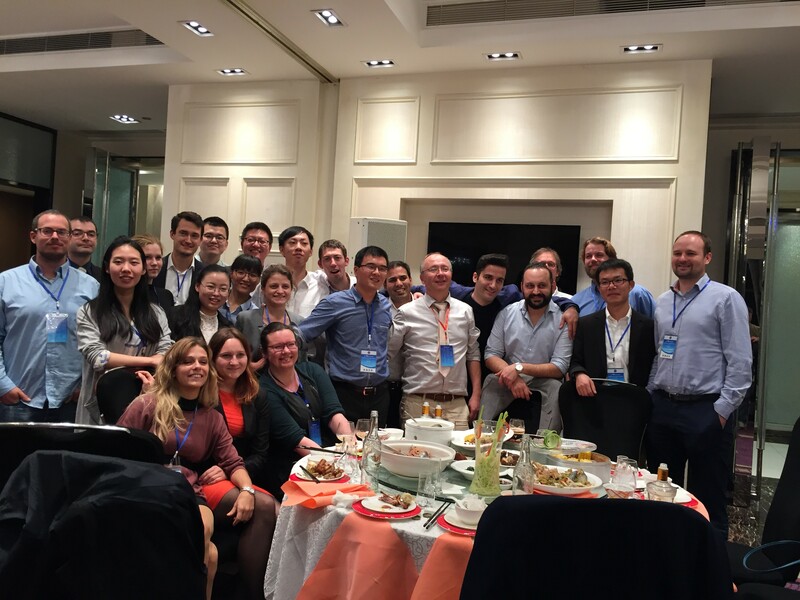 Standing (from left to right): Yuri Hendrix, Chris Straub, Yangyueye Cao, Ekaterina Loginova, Daan Glas, Zhengyao Qu, Xiaoxiao Zhang, Pei Tang, Gang Liu, Anna Kaja, Xu Gao, Florent Gauvin, Qingliang Yu, Qadeer Alam, Jos Brouwers, Hoss Karimi, Azee Taher, Sieger van der Laan, Perry van de Wouw, Peipeng Li and Przemek Spiesz (Wuhan, 2017). In December 2017 the HTM-STW-M2i (High-Tech Materials-Dutch Technology Foundation-Materials Innovation Institute) 4-year project "Fire safety of innovative geopolymer-based building materials" has been granted. In total one PhD (K. Klima M.Sc.) and one post-doc will work on the development of fire resistant geopolymer-based coatings and concretes.